This baked falafel dish is a lighter version of traditional fried falafel, yet it’s still packed with flavor. 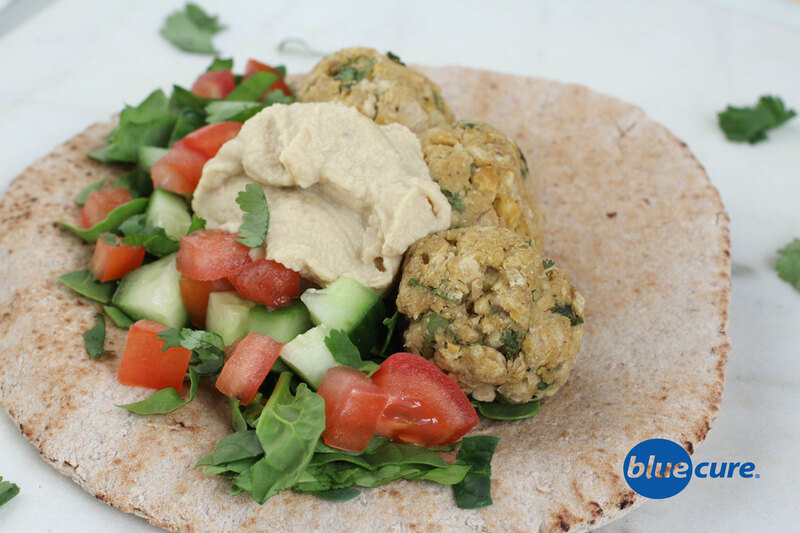 Falafel is made from a base of chickpeas, which are a great source of plant-based protein. A delicious meal idea for Meatless Monday! Falafel tastes great served with a whole grain pita bread or topped on a salad with hummus or baba ganoush. Add cucumber, tomatoes, and cilantro for a light and refreshing taste. *or swap in ½ cup oat flour, which can easily be made in a blender. In a food processor, pulse the chickpeas with the parsley, cilantro, garlic powder, cumin, lemon juice. In a bowl, combine the chickpea mixture, chickpea flour and flaxseed. Stir until well combined. With clean hands, roll the batter into 8-10 balls. Place on a baking sheet and bake for 20-30 minutes. (Note: if you do not have a food processor, chop the herbs small. Using the back of a fork, mash the chickpeas and then add the spices/ herbs, lemon juice, chickpea flour, and ground flaxseed. Stir/ mash until well combined). Chop the cilantro, cucumber, spinach/ kale, and tomatoes. Layer the veggies and falafel on a pita. Top with hummus or baba ganoush. Enjoy!